This Auction is a Cash Sale, with No Reserve! It Ends April 9th, at 10:41PM Eastern Standard Time. To buy this property, click the following link to participate in our Ebay Auction. You can bid for it in the auction, or purchase it immediately for the “Buy it Now” price of $3,999. 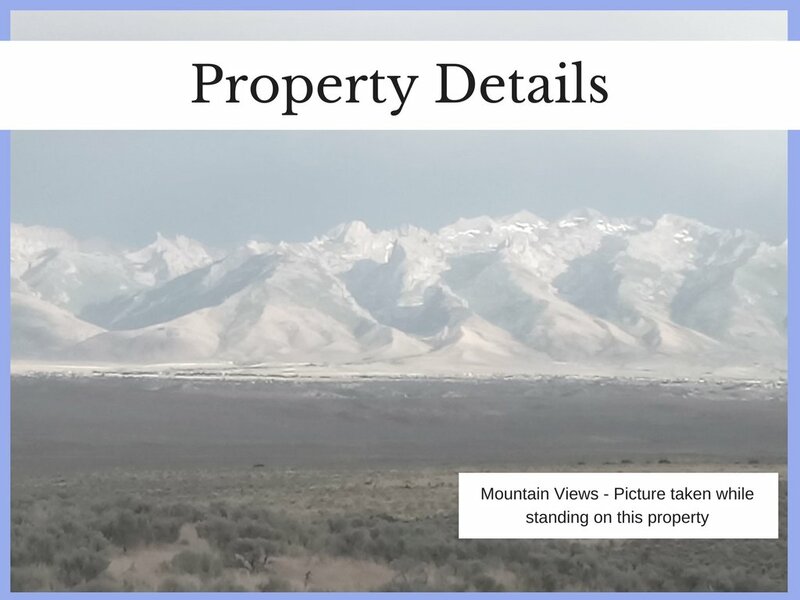 Click This Link: Ebay Auction for 2 Acre Lot in Northern Nevada, Ending April 9th at 10:41PM EST. To be notified when we have new properties available by auction, sign up for our Email List, using the box on the right hand side of this page. Cash Auction, No Reserve: You are Bidding on the Full Property Price. This auction has No Reserve. 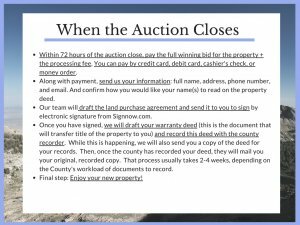 The winning bidder will get the property for their winning bid amount plus a $295 processing fee, which pays for document preparation, recording fees, and transfer taxes. This property in the past sold for $5,402. 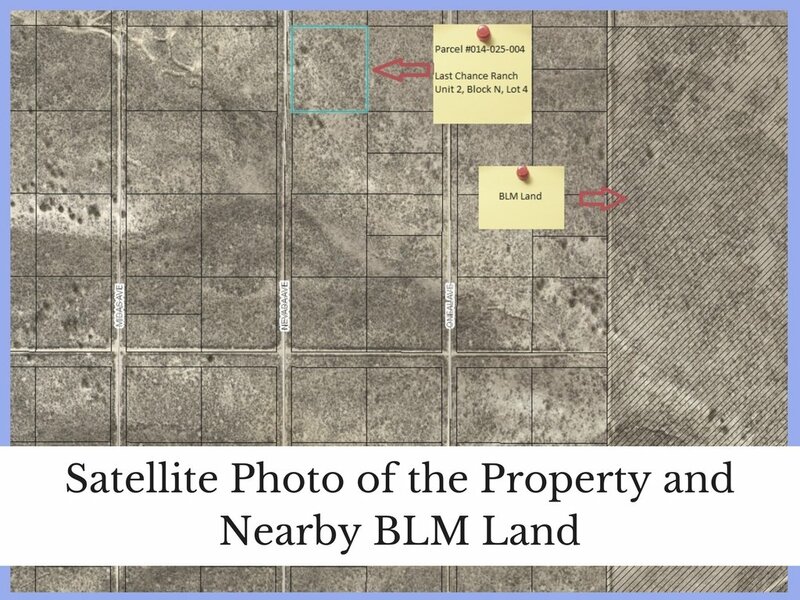 The 2 acre property next to it (Lot #5, to the south), sold for $7,000. The 2 acre parcel that’s 2 lots down the street from this one (Lot #6, 2 lots to the south), sold for $6,999. 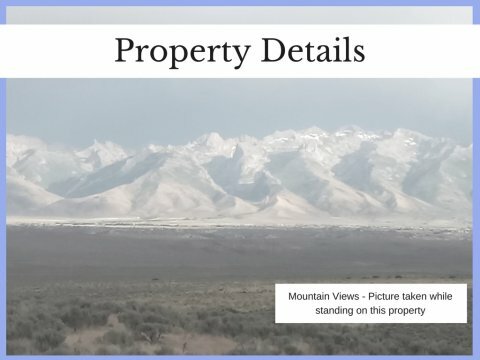 Photos: The 2 photos you see in this picture, were taken while standing on this property. 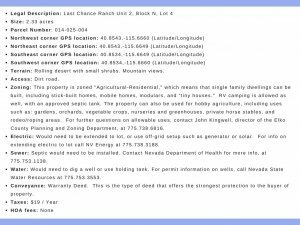 Access: You can get to this property by a dirt “jeep road.” You can see it on the county aerial map on this listing. It’s a bumpy road, and we would recommend a 4 wheel drive vehicle and caution after rain or a storm. Use the GPS coordinates below to see the property on Google Maps, etc. Deed and Title: We will convey this property by Warranty Deed, which is the type of deed that offers the strongest protection to the buyer. 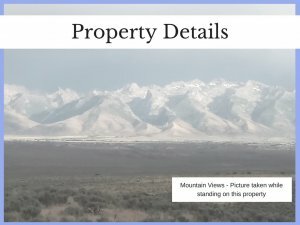 Taxes are paid current on this property, and we conducted a full title search through a title company when we bought this parcel to make sure it has a clean title. Contact Us: Please contact us with any questions before bidding…thanks! We’d be happy to answer your questions. 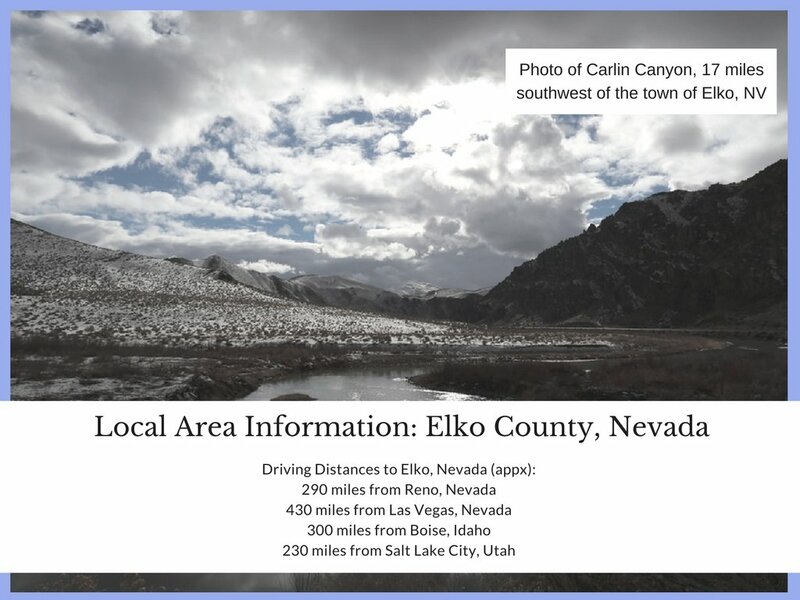 Elko County, Nevada is rugged and wild – one of the last stretches of the “old west” left in America. It is not for everyone, as it can be remote and far from suburban conveniences. 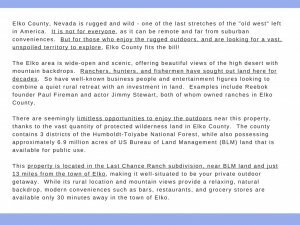 But for those who enjoy the rugged outdoors, and are looking for a vast, unspoiled territory to explore, Elko County fits the bill! The Elko area is wide-open and scenic, offering beautiful views of the high desert with mountain backdrops. Ranchers, hunters, and fishermen have sought out land here for decades. So have well-known business people and entertainment figures looking to combine a quiet rural retreat with an investment in land. 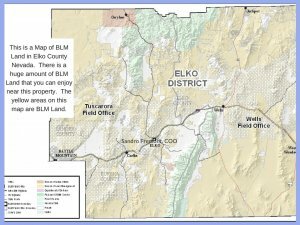 Examples include Reebok founder Paul Fireman and actor Jimmy Stewart, both of whom owned ranches in Elko County. 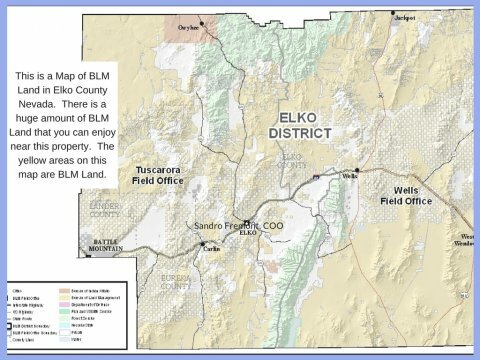 There are seemingly limitless opportunities to enjoy the outdoors near this property, thanks to the vast quantity of protected wilderness land in Elko County. 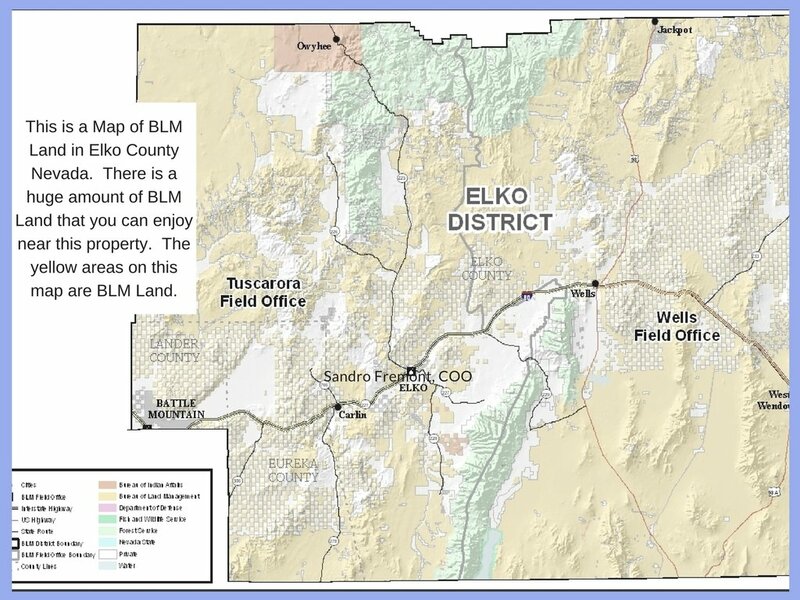 The county contains 3 districts of the Humboldt-Toiyabe National Forest, while also possessing approximately 6.9 million acres of US Bureau of Land Management (BLM) land that is available for public use. Hiking, hunting, fishing, horseback riding, camping, and mountain biking in the vast stretches of protected wilderness land in Elko County. 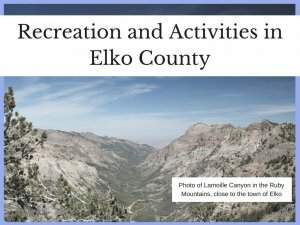 See our blog for details on some of the best places to hunt and fish in Elko County. Heli-Skiing, rafting, and much more. 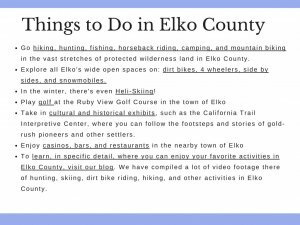 To learn more about all the things you can do in Elko County, visit our blog. We have compiled a lot of video footage there of hunting, skiing, dirt bike riding, hiking, and other activities in Elko County. Conveyance: Warranty Deed. This is the type of deed that offers the strongest protection to the buyer of property. Please Note: These directions are from Google Maps, and as with any directions from Google Maps, they may have changed since the last time Google updated their data for this area. So, please double check the directions before visiting the property. 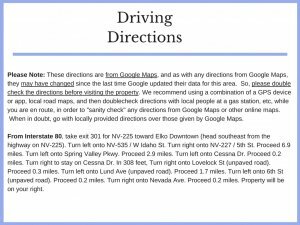 We recommend using a combination of a GPS device or app, local road maps, and then doublecheck directions with local people at a gas station, etc, while you are en route, in order to “sanity check” any directions from Google Maps or other online maps. When in doubt, go with locally provided directions over those given by Google Maps. From Interstate 80, take exit 301 for NV-225 toward Elko Downtown (head southeast from the highway on NV-225). Turn left onto NV-535 / W Idaho St. Turn right onto NV-227 / 5th St. Proceed 6.9 miles. Turn left onto Spring Valley Pkwy. Proceed 2.9 miles. Turn left onto Cessna Dr. Proceed 0.2 miles. Turn right to stay on Cessna Dr. In 308 feet, Turn right onto Lovelock St (unpaved road). Proceed 0.3 miles. Turn left onto Lund Ave (unpaved road). Proceed 1.7 miles. Turn left onto 6th St (unpaved road). Proceed 0.2 miles. Turn right onto Nevada Ave. Proceed 0.2 miles. Property will be on your right. 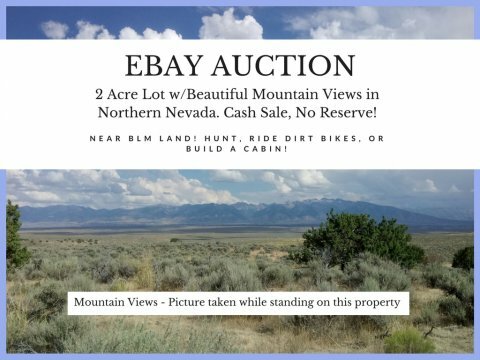 Within 72 hours of the auction close, pay the full winning bid for the property + the processing fee. You can pay by credit card, debit card, cashier’s check, or money order. Along with payment, send us your information: full name, address, phone number, and email. And confirm how you would like your name(s) to read on the property deed. Our team will draft the sales agreement and send it to you to sign by electronic signature from Signnow.com. 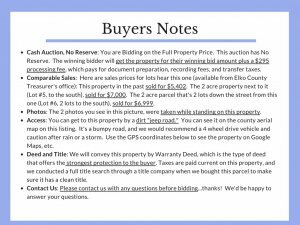 Once you have signed, we will draft your warranty deed (this is the document that will transfer title of the property to you) and record this deed with the county recorder. While this is happening, we will also send you a copy of the deed for your records. Then, once the county has recorded your deed, they will mail you your original, recorded copy. That process usually takes 2-4 weeks, depending on the County’s workload of documents to record. Final step: Enjoy your new property! 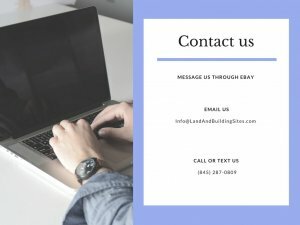 The information provided in this advertisement is true and accurate to the best knowledge of the Seller, and is the result of our research. We take pride in selecting properties that can provide excellent value to our buyers, and always seek to accurately present them to you. 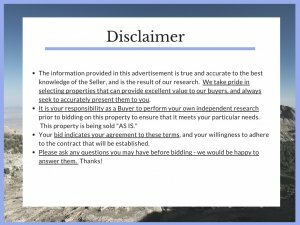 Your bid indicates your agreement to these terms, and your willingness to adhere to the contract that will be established. Please ask any questions you may have before bidding – we would be happy to answer them. Thanks!